Showing 14 posts in News & Events. Fashion 411 Speaker Series – Lansing Welcomes Jen Guarino! What a great way to start The Runway’s 411 Speaker Series! 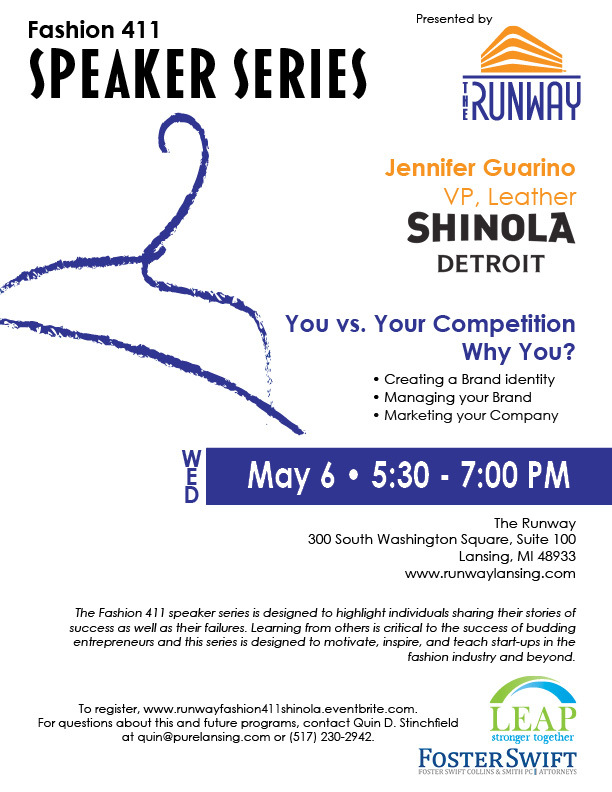 If you’ve heard of Shinola Detroit (and surely you have), do not miss Jen Guarino’s May 6 presentation. Jen is the VP of Leather at Shinola and will address creating and maintaining a brand identity and marketing your company. I cannot think of a cooler, more integrated brand identity and marketing strategy than Shinola’s. To learn from its example will be an excellent opportunity, and to learn it from Jen will be a special treat. She is, in my opinion, the rock star of Michigan’s maker movement. I hope to see you at The Runway on May 6. Fosterfashion plans to follow up the discussion of branding with the legal side of that topic – trademarking. If you can’t join us on May 6, check back here after that date for the specifics on our trademark presentation and workshop – so that you can Make Your Mark. Foster Swift Attorney John Mashni is a member of the firm’s Fosterfashion team. Some of The Runway’s designers have had an opportunity to meet John and appreciate his expertise and advice in selecting and forming an entity. I know that John speaks from personal experience, as an entrepreneur, when he advises fashion start-ups. However, I did not know until I read the article below that he, unfortunately, also draws on personal experience when addressing the topic of identity theft. If you have yet to file your tax return, please take a look at John’s article in our firm’s recent Business & Corporate Law newsletter. 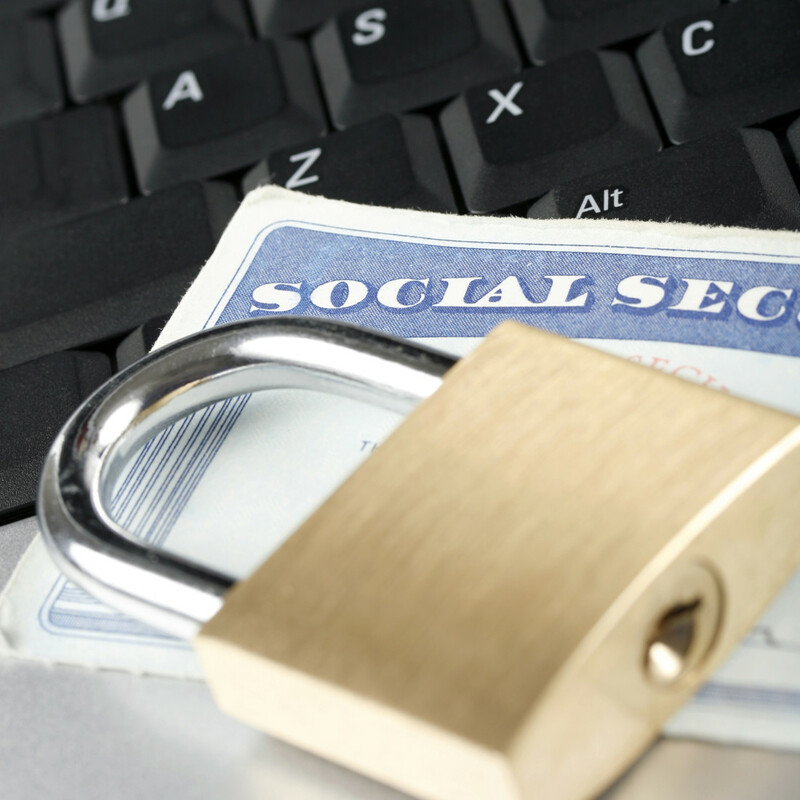 As John advises, filing your tax return early will increase your odds of avoiding identity theft. Congratulations Runway Designer Katie Raynard! We were so pleased to see that Katie Raynard, an associate designer at The Runway, was recognized by Michigan State University! 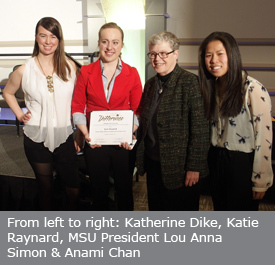 Katie received MSU’s 2015 Excellence in Diversity, Making a Difference Through Artistic Expression Award. This award is given by MSU’s Office for Inclusion and Intercultural Initiatives, which has a long-standing tradition of recognizing members of MSU’s community whose efforts support an environment where diversity and inclusion are valued.